In order to be full participants in today's rapidly-changing world, students need to be media producers, not just consumers. Asking students to create with digital tools provides an authentic opportunity for them to not only engage with curriculum content (3R's), but also also build essential digital-age skills (4C's). Sharing student work with the world beyond the classroom gives students a reason to care and a motivation to work hard. Wixie makes it easy to create and share a range of digital and print products that demonstrate their learning. Wixie works online so student work can be shared instantly through a URL. Student work can also be exported for use as authentic print and digital products. What can this digital communication look like? Students can use Wixie to design and create a range of authentic products that inspire, inform, raise awareness, tell stories, and persuade. From printed posters, to online greeting cards, to public service announcements, Wixie gives students the tools to easily create and quickly share their work with a real world audience. Students can choose to create and share the product that best matches the purpose and goal of their work. For example, students can use Wixie to create and export eBooks that serve as flipped classroom tutorials or how-to's that inform, public service announcements that persuade, or stories that entertain and inspire. How do you share student work in Wixie? All Wixie projects are available online without any extra steps to publish! Students simply share the project URL to showcase their knowledge and ideas outside of the classroom. 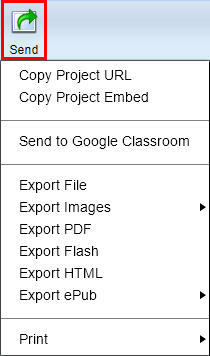 Students can use Wixie's Send options to export their work into digital formats such as PDF, HTML, and ePubs (eBooks). While Wixie works online, students can also print their work in a variety of formats. 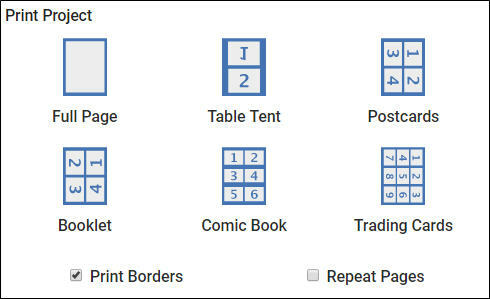 They can use repeat page options to print a single page multiple times for products like postcards and trading cards. They can also print the pages of multi-page projects onto a single sheet of paper for products like comics, cards, and booklets. Students can use Wixie to demonstrate learning and engage with the curriculum in a variety of ways. Sharing their work with an audience beyond the classroom shows students that their work in the classroom matters motivates them to work hard and give their best effort. Students can use Wixie to demonstrate learning and engage with the curriculum in a variety of ways. Sharing their work with an audience beyond the classroom shows students that their work in the classroom matters and motivates them to work hard and give their best effort.